TV Reviews | No Chic. Just Geek. We live in a more connected world than was once the case. These days day-and-date releases for major movies are standard practice, and big TV premieres also happen close together in different parts of the world. 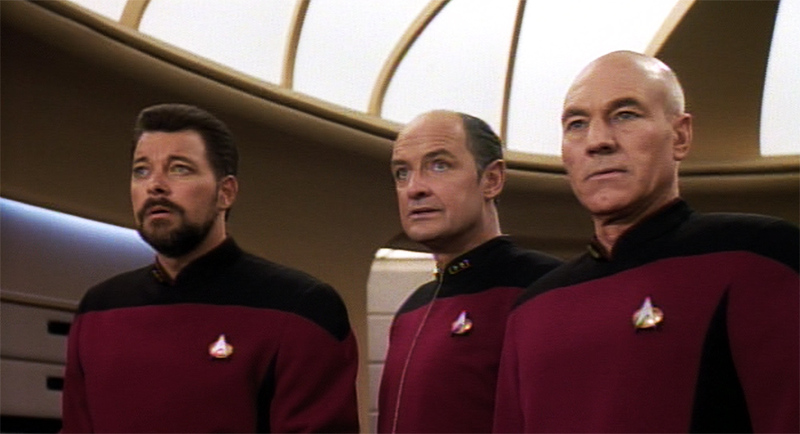 It was not always thus, of course: I remember the sense of resignation with which I learned that that Star Trek TNG would not receive a UK transmission until 1990 (three years after its American debut). There was once a time when it was seriously speculated that the delay in the UK release of The Phantom Menace (two months after its US opening) might actually impact on tourism figures, as people went to the States solely or partly in order to see it. Doesn’t happen these days, of course. Something else that doesn’t really happen any more is the phenomenon where US TV networks, having splashed out big money on a TV pilot or two-part episode, arranged to have their TV show released into theatres in Europe and other foreign territories, in an attempt to recoup their investment. I remember seeing in the very early 80s a movie entitled Spider-Man: The Dragon’s Challenge, which was an extended episode of the TV series starring Nicholas Hammond. Also earning big-screen outings in Europe were various episodes of the Bill Bixby Hulk series, and – most relevantly for our purposes today – Battlestar Galactica. Strictly speaking there were three Galactica movies, if you lived outside the US at least: one which was a re-edited version of the pilot episode, plus Mission Galactica (cobbled together from elements of the episodes The Living Legend and Fire in Space), and Conquest of the Earth (a similar fix-up derived from the follow-up show Galactica 1980, which I came across being shown at a Butlin’s in about 1983). But let’s stick to the original, directed by Richard Colla. Things get underway with portentousness dialled up to maximum and an opening voice-over from an uncredited Patrick Macnee, who presumably appeared as a favour to an old friend and for a hefty fee. ‘There are those who believe that life here began out there… some believe that there may yet be brothers of man, who even now fight to survive – somewhere beyond the heavens!’ Well, that’s as maybe, but as a glance at any newspaper will tell you, these days some people will believe anything. Well, anyway, somewhere beyond the heavens we find the assembled fleet of the Twelve Colonies of Mankind (yes, I know: but they seem not have discovered gender-neutral nomenclature beyond the heavens), who are happily anticipating the conclusion of hostilities between their people and the Cylons, who seem to be oppressive alien robots. We really don’t learn much at all about the Cylons, except they apparently ‘hate freedom’ and want to eradicate civilisation as we know it, which is the kind of lazy propaganda you see on the right-wing news; it would be interesting to hear the Cylons’ point of view, but we never really do. Alone in his scepticism about the coming armistice is basso profundo (and, it must be said, somewhat nepotistic) patrician Commander Adama (Lorne Greene), whose suspicions turn out to be well-founded: two of his sons, flying a patrol mission in their space fighters, discover a massive Cylon ambush. It turns out that peace broker Count Baltar (John Colicos) has sold them all out. There is, of course, a very good reason why Battlestar Galactica received its US premiere in 1978, only a few months after George Lucas’ initial stellar conflict opus began its demolition of box office records. On top of all the space battles, laser blasters, weird aliens and so on being displayed here, calling this story ‘Saga of a Star World’ was probably overdoing it – almost inevitably, accusations of plagiarism and a lawsuit ensued. Battlestar Galactica is kind of respectable again now, mainly due to the success of Ronald D Moore’s Bush-era retelling of the tale (a programme I find it easier to admire than to genuinely like), but for a long time this was not the case: it had a reputation for being cheesy and po-faced and sometimes unintentionally camp. The creator of Babylon 5 instituted a ‘no cute kids or robots’ rule for his show, and you can’t help thinking that this was at least in part a reference to Galactica, which frequently has both in close proximity. However you view the relationship between the main show and Galactica 1980, this is still another US SF TV series that failed to last more than a couple of seasons. It’s got to be tosh, right? Then you spend the next few minutes going ‘Hang on, I’ve just seen this bit,’ for they start very obviously re-using special effects footage within the first half-hour and continue to do so throughout. Battlestar Economica might have been a better title for this project; it’s round about this point that most people start paying more attention to the plot and the acting. There’s an odd sort of twin-track approach going on here – obviously, much of the plot is derived from an odd mish-mash of classical and religious influences. There are characters called Apollo, Athena, and Cassiopeia, and many elements of the story are based on Mormon theology; the tone of the programme occasionally resembles that of a Biblical epic with extra ray-guns. ‘And the word went forth to every outpost of human existence, and they came…’ declaims Greene at one point. On the other hand, most of the rest of it is late-70s quotidian stuff, with disco dancing, interesting haircuts, and so on. The younger characters are designed to be archetypes, for maximum audience identification – there’s earnest young leader Apollo (Richard Hatch), loveable rogue Starbuck (Dirk Benedict), feisty single mum Serina (Jane Seymour), and so on. Chief human villain Baltar is a bit of a panto turn. You wouldn’t expect the two styles to go together particularly well, but they somehow do: it is sometimes camp and cheesy, and sometimes (as mentioned) rather po-faced and portentous, but still strangely watchable. This is not the subtlest of programmes – ‘broad’ is perhaps the kindest way to describe the default performance style of everyone involved – and while it is occasionally somewhat sentimental, it is seldom full-on mawkish. It’s still the case that you can practically see the joins where this pilot movie will be chopped up to make at least three separate episodes when the show goes into syndication, for the plot is episodic at best – there’s the opener, concerning the apocalyptic Cylon attack on the colonies, then some rather humdrum stuff about food shortages in the fleet and a minefield that must be traversed, and finally the secret of the space casino of the planet Carillon and its insectoid owners. But it holds together, just about. I don’t know, I find it very easy to indulge the original version of Battlestar Galactica, mainly because I am amused by the way in which its lofty storytelling ambitions collide with the minutiae of making a weekly mass-audience TV drama (here’s some more Mormon theology, along with a guest spot by Fred Astaire), but also because it does manage to give a better sense of an epic voyage across the galaxy in one season than Voyager managed in seven (yes, I genuinely think that). You couldn’t honestly describe the pilot as great, but much of it is good and most of the rest is not that bad either. Hulk have Close Encounter! Hulk smash Military-Industrial Complex! There seems to be a bit of a pattern developing, at least to the extent that whenever I end up writing about The Incredible Hulk TV show it’s more than likely to concern episodes from the fourth season. The reason for this is fairly straightforward – with any long-running, somewhat-formulaic series, most of the episodes tend to blur together and become fairly indistinguishable. The thing about the fourth season of Hulk is that there seems to have been a genuine attempt to push back against the constraints of the existing format, with episodes that break new ground or explore the characters in a new way. This tendency is there from the very start of the season, which opens with the two-part story Prometheus. This is so radically different from the typical Hulk episode that it almost looks like the series is undergoing a significant reformat – for good or ill, this turns out not to be the case. The story is written and directed by series overseer Kenneth Johnson, and opens with US military radar detecting an object heading for Earth out of deep space. It must be an asteroid, but… it’s a strangely symmetrical cylinder! What can it be? At least the radar techs are certain where it’s going to come down: northern Utah. Which is where, naturally, we catch up with our man David Banner (Bill Bixby, of course), who is doing a spot of fishing. This turns out to be rather incongruous, given we later learn he has recently had one of his episodes and is planning to make his usual rapid and discreet departure, but I suppose even irradiated fugitives are allowed a fish supper now and then. Anyway, Banner comes across a young woman who has fallen in the river, and ends up fishing her out as well. She turns out to be Katie, a recently-blinded pianist who has retired to the wilderness to be alone with her bitterness (even in one of the more genre-oriented Hulk episodes, they find time for some slightly sentimental melodrama, but this is one of the series’ charms if you ask me). Katie is played by Laurie Prange, who clearly specialised in this sort of thing: she played an heiress suffering from hysterical paralysis in the series’ second pilot. Well, unbeknownst to Banner and Katie, the military are preparing for the arrival of the mysterious space object, although running the show is an equally mysterious agency known as Prometheus. McGee (Jack Colvin), who is in the area checking up on the recent Hulk appearance, smells a story, and starts to poke around. Sure enough, the meteor enters the atmosphere as predicted – ‘A shallow trajectory! Almost like it’s being piloted!’ says someone in uniform. As you can see, the episode seems to be foreshadowing something highly unusual about the object, possibly even the appearance of a genuine extraterrestrial. But this is all a bit of a red herring: on this occasion, a rock is just a rock, albeit one with some unique properties. As luck would have it, Banner and Katie are in the area when the meteorite strikes, and – thinking it may be a plane crash, with survivors needing help – Banner selflessly trots off to investigate. All he finds is a big rock – but it’s one that seems to cause him severe discomfort, the closer he gets to it. Being Banner, he ends up tripping over a beehive and turning into the Hulk (Hulk smash bees!). It has to be said that this is an extremely well-done set piece, especially considering that not very much happens. Katie is less than thrilled when the Hulk bashes his way into her cabin, and frankly non-plussed when he reverts back to Banner. Or does he? Here the episode unveils its biggest new idea: the meteorite is giving off unique gamma radiation which screws up Banner’s body chemistry even more. Banner hasn’t fully changed back; he’s stuck in a transitional form between his human form and the Hulk, with somewhat enhanced strength, limited mental capacities, and a bestial appearance. This Demi-Hulk is mostly portrayed by Bixby under prosthetics, but there are frequent and somewhat instrusive moments where bodybuilder Ric Drasin plays the Demi-Hulk in long shot. You could probably argue that Prometheus‘ first episode is built around some suspiciously static set-pieces, but the combination of big ideas, lavish production values and excellent direction still make this one of the best episodes of the series. Of course, the second episode has the job of paying off this set-up, and it’s here that the story stumbles a bit. All over the country, scientists attached to Prometheus are being activated and brought to the agency’s secret base, in the belief that the Hulk is actually an alien who arrived on the meteorite (there’s a very X-Files/Andromeda Strain vibe going on here). Meanwhile, the (now badly dented) dome is brought in, Katie is whisked off for examination, and the Hulk is placed in an observation area inside a microwave force-field (quite how the Hulk and Katie are separated is, once again, perhaps best not worried about). 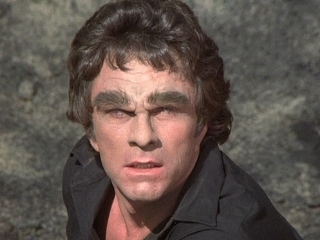 This is still a very strong and distinctive episode, not least because it is so Hulk-centric – Lou Ferrigno gets much more screen-time than usual, possibly even more than Bixby. And the big new ideas keep coming, with the revelation that Prometheus is a secret government agency tasked with handling possible alien contacts and exploiting any discoveries in the American national interest (a bit like the Torchwood Institute from that other show, in fact). There’s the prospect of a team-up between McGee and Prometheus in order to capture and study the Hulk. But all of this… doesn’t really go anywhere, unfortunately. The big climax of the episode largely concerns Banner’s relief at discovering that, away from the meteor fragments, he can fully de-Hulk himself. Which is fine, but the Hulk has been the object of so much of the episode, that for it to conclude with him as its subject is a slightly jarring shift. And there is a lot of padding and filler in the episode – the Prometheus scientists are introduced in detail and at length (slightly sleazily, in one instance), there are endless scenes of the Alpha Chamber being moved about by crane, and so on. Even a scene in which McGee discovers the shady hidden agenda behind Prometheus doesn’t contribute much to the plot. You almost wish the episode had really gone all the way with the sci-fi B-movie vibe and had the meteorite disgorge some kind of gamma-guzzling alien monster for the Hulk to have a proper fight with. There’s certainly slack in the episode that could be used to accommodate setting this up, and I’m sure it would have been a great climax. There was also clearly a big budget for this episode, so producing another monster suit could certainly have been possible. The series wasn’t afraid to go down this route just a few weeks later with the Hulk-on-Hulk battle at the end of The First. So one wonders why Prometheus doesn’t just go for it a bit more. 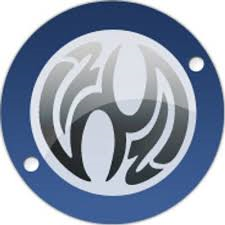 In the end, though, everything just resets back to normal come the end, with the exception of Katie being less of an embittered recluse: Banner magically replaces all his stuff and goes back on the road, McGee goes back to hunting the Hulk, and so on. Given the Hulk has just demolished a multi-million dollar base, one wonders why the US government don’t pursue him much more actively from this point on, but that’s TV from this point in time: the episodic format was king, even if it could productively be pushed against sometimes. This is why I say that Prometheus is only halfway-brilliant – it’s full of potential which never quite gets fully realised. But even a halfway-brilliant Hulk story is still extremely watchable TV. Hulk Go Electric! Hulk Get Headhunted! Which leads us to Deep Shock, an episode from early in the fourth season of The Incredible Hulk, originally broadcast in late 1980. The show was sixty episodes in by this point, so perhaps it’s understandable that a) the series should feel a little formulaic by this point and b) the makers should be trying to shake things up a little bit. We find ourselves at the Tres Lobos power plant, which is currently being converted to automatic control, something causing no end of grumbling amongst the workers who suspect they are conniving in their own redundancy by making the alterations. 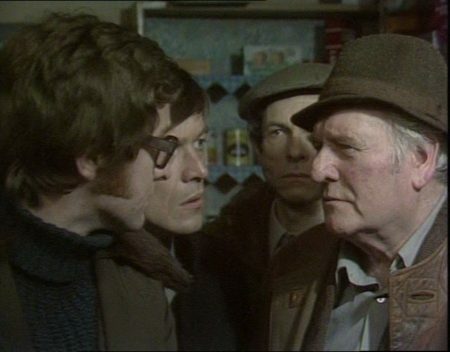 Also helping out, which if nothing else proves there was a major shortage of labour in the early 80s, is our man David Banner, employing one of his trademark wafer-thin alibis (‘David Benton’ this week). Well, Banner finds himself co-opted into helping the gruff-but-caring shop steward Edgar (Tom Clancy, but not the famous one) on a tricky part of the job – but it turns out that Edgar has an undisclosed heart condition and things do not go according to plan. Soon a high-voltage cable is spitting sparks everywhere, endangering both men. Despite the fact the episode has only just started and it’s really much too early, Banner turns into the Hulk and saves Edgar’s life – but in the process he is exposed to a massive burst electricity, enough to flatten even the Hulk. After a day or so in a coma, Banner wakes up in hospital, where the attending physician (Sharon Acker) is pleasantly surprised by his resilience (Banner stays deadpan about this). But she is also concerned about his mental state – apparently being electrocuted can have strange side-effects, and she’s also noticed that his brain contains a high level of a chemical associated with split-personality syndrome – does he have any history in this department? (Banner stays deadpan about this too.) I’m not sure the neuroscience in this episode is really up to much, even by the standards of 1980. Banner checks himself out and moves in with Edgar, just in case he does have any side-effects, and also to progress the plot. Edgar is about to be forced to retire, because of his heart, but there is still the future of his guys to resolve! And also the issue of how safe the plant will be when it’s run solely by machines. The heartless suits who run the place just don’t seem to care. It doesn’t work out that way, of course, and the episode concludes with the Hulk tearing through the odd wall and smashing up a few consoles, after Edgar basically hijacks the plant in an attempt to show how vital human involvement in managing the place is. It all feels a bit contrived, and an attempt to do the end of The China Syndrome on TV with a rather low budget (The China Syndrome was in movies the previous year, around the time of the Three Mile Island incident – I will just mention again that Banner is working at the ‘Three Wolves’ power plant). Also, with the first Hulk-out shifted to the start of the story, the episode feels like it has a rather flabby middle, with arguments about industrial relations and the usual low-comedy business with Banner and McGee just missing each other in hospital lobbies not doing much to help. In fact, other than the movie pastiche and the slightly odd structure, the most distinctive thing about Deep Shock is the Banner-becomes-precognitive element, which is certainly a curve-ball and quite atypical of what’s usually a studiously down-to-earth programme (or as studiously down-to-earth as a programme about a green gamma monster with an infinite supply of jeans can be). I can’t help wondering if the whole psychic-powers element of the story was a late addition to pep the rest of it up. It doesn’t really impinge on the main storyline and could easily have been cut without too much difficulty. In any case, it produces an episode which is ultimately distinctive without being especially distinguished. I’m not entirely sure the same isn’t true for the next episode, Bring Me the Head of the Hulk (not something anyone says, or seems likely to say, in the story itself), for all that it regularly pops up in ‘Top Ten Best Hulk Episodes’ lists. This is yet another shake-up-the-formula episode; the start of season four had a lot of these. I suppose it is especially noteworthy for being directed by Bill Bixby, the star of the series. You would have thought that a consummate actor like Bixby would have been a shoo-in to direct one of the more character-driven episodes, but this is almost pure action-adventure stuff. It begins with a Hulk-out already underway, with the creature demolishing another laboratory before vanishing into the night. But news of this latest Hulk-sighting is delivered to Paris, France (stock footage from the Universal library duly sets the scene), where psychopathic mercenary La Fronte (Jed Mills) seems to be tracking the Hulk’s appearances. ‘Another genetics lab,’ says his (apparently) faithful lieutenant, Alex (Sandy McPeak), seemingly unsurprised. The thing about Bring Me the Head of the Hulk is that it does rather ignore all the conventions of the series as established up to this point – that the Hulk is an urban legend like Bigfoot, primarily. Here it’s strongly implied the Hulk goes around wrecking genetics labs on a fairly regular basis, and that this makes it into the media somehow or other. If so, why aren’t the police and army hunting the Hulk, instead of just the lonely and quixotic McGee? The episode also implies that working out the Hulk’s real identity is not that challenging either. Well, anyway, La Fronte goes to the offices of McGee’s paper and promises to kill the Hulk for them, in exchange for a truckload of cash. McGee demurs, partly because he has come to realise the Hulk is essentially benign, but also because he knows the creature is also a normal person most of the time. So the mercenary heads off to the paper’s competitor, who agree to bankroll his Hulk-killing scheme. Here we do step rather a long way from credibility, if you ask me. La Fronte’s cunning plan is to set up his own genetics research lab, advertise for staff, and then give preference to hiring people who match his Hulk profile. If he’d talked properly to McGee, he’d know just to hire people with the first name David and a surname beginning with B, but I digress. Needless to say, Banner (using the cunning pseudonym David Bedford) applies and makes it onto the shortlist of Hulk-suspects, together with five other guys. Bring Me the Head of the Hulk is, obviously, a rather different episode: it has three Hulk-outs (well, two and a half, at least); it has someone actively pursuing the Hulk, with considerable success; we actually get to see Banner on the phone applying for another of the endless jobs he drifts through (and his interview technique is so dreadful it’s a miracle he ever gets work); we get to see McGee actually saving the Hulk’s life, for a change. But is there quality to match the novelty? And, to be honest, I kind of miss the down-to-earth naturalism and character stories which this series usually does so well. The closest we get to that here is a subplot about Alex and Banner becoming friends, leading the somewhat world-weary mercenary to question his allegiance to La Fronte. It’s good stuff, well played by McPeak, but rather peripheral here. The main plot is so atypical and busy that everything else gets squeezed out – this might have worked better and had more space to breathe had it been a two-parter, but this season already had two of them – the brilliant The First and the nearly-brilliant Prometheus. As I say, it’s hard to keep this kind of series fresh, so I suppose the makers of The Incredible Hulk deserve credit for trying so hard. In the end I would have to say that Bring Me the Head of the Hulk is the better of these two episodes by far, but is it a classic? I’m still not sure. As chance would have it, just the other day I passed several fairly agreeable hours watching Euston Films’ 1979 pre-apocalyptic drama Quatermass, even as the telly was full of pre-launch publicity for Euston Films’ 2018 pre-apocalyptic drama Hard Sun, currently showing on BBC One. The media has also been marking the fact that it’s forty years since the TV debut of Blake’s 7, with some unusually complimentary retrospectives concentrating on the programme’s dystopian sensibility and paranoia rather the overacting and spaceships made out of hair-dryers. The first episode establishes the tone for much of what follows, as we meet DCI Cockney Geezer (Jim Sturgess), who seems like a devoted family man despite the fact he’s quietly knocking off his dead best mate’s wife. The circumstances in which the dead best mate passed on are sufficiently suspicious for Geezer’s boss, DCS Annoying Pen-pusher, to believe Geezer may have done him in, and to this end DI Cynical Gamine (Agyness Deyn) has been planted on Geezer’s team to secretly investigate him. (I like shows which have a bit of Agy, but I’ve never seen one with as much Agyness as this one.) Gamine is doing this so her unhinged son, whom she appears to have given birth to when she was about seven, does not go to prison for attempting to murder her. One thing you can say about Hard Sun: it’s never knowingly under-plotted. Well, in their first day on the job together Geezer and Gamine find themselves working on the case of a conspiracy-theory obsessed hacker with ASD (oh, sigh) who has turned up dead. One of his mates has got his hands on the dead guy’s USB stick, which is disguised as a Saturn V rocket but may as well just be a box with PLOT DEVICE scrawled on it. Our heroes recover the USB but find themselves pursued by the security services, intent on killing everyone who comes into contact with the information on the stick. But why? Needless to say, Geezer and Gamine can’t resist taking a peek, hoping this will give them leverage to get the homicidal spooks to back off. It turns out that – well, here’s the thing: we never get to see what’s on the stick beyond a few blipverts of graphs and suchlike, but everyone who does look at it properly confirms that it concerns the government’s advance planning for the end of the world (codenamed Hard Sun), which is due in five years time. I have to admit to being somewhat bemused by this, because the government appear to have managed to plan their response to the end of the world without ever letting on exactly what’s going to happen. Even after they’ve looked at the stick, Geezer and Gamine are left speculating as to just what is heading their way – is a comet going to hit Earth? Is it some kind of environmental catastrophe? They seem to be in the dark. Presumably this is just to maintain a sense of foreboding mystery; it also gives them a ready-made opportunity for a big reveal come the last episode of the series. Well, the first episode reached fairly deep into the bag of Modern Cop Show cliches, but I do like a bit of apocalyptica, and I was curious to see just how the rest of the series would play out (episode one concludes with Gamine taking a redacted set of the information to the media), and just how strong the SF element would be in the mix. Courtesy of iPlayer’s box set function and the fact I had a day with not much going on (not to mention the fact that Hard Sun is the kind of show you can put on in the background while doing something else and honestly not miss much), I ended up having watched the rest of the first series within the next day. And the answer to the ‘how SF is it?’ question is: really not very much. Hard Sun boils down to being another of those bleak and bloody cop shows, with the difference being that this time it’s understandable why the leads are so glum all the time: the world’s apparently going to end, after all. The thing is, though, that the impending apocalypse is primarily just a mood-setting thing – the various killers that Geezer and Gamine find themselves contending with are all nutters who’ve been drawn out of the woodwork by the release of the Hard Sun info, but it’s established at the top of episode two that nearly everyone has been convinced this was a hoax. Life goes on as normal for nearly everyone; you could rewrite the middle episodes of this series to extract the impending doom/science fiction element very easily. It’s mainly just there to provide an atmosphere of existential misery – Hard Sun‘s signature bit is a scene where Gamine and Geezer sit down together in the middle of a case and wail ‘But what does any of it matter anyway? We’ve only got five years left!’, which happens in nearly every episode. Subsequent episodes are mostly competent but fairly undistinguished takes on the kind of story you’ve seen before – a barking ex-husband takes his children hostage, a man outraged by the cruelty of the world starts killing nice people and challenges God to intervene and stop him, a serial killer preys on suicidal people, and so on. There are lots of people in hoodies stalking darkened streets, and so much knife-related violence that it’s easy to imagine the BBC being forced to pull Hard Sun on taste and decency grounds, given the current plague of knife crime in London. What’s really absent is any kind of moral centre, for as the series proceeds Geezer and Gamine reveal that they are prepared to do just about anything to further their cause, which only occasionally involves catching criminals. When they’re not actively beating each other up with their collapsible truncheons, the doom-conscious duo are forever disregarding standard procedure, obstructing or perverting the course of justice, or plotting the cold-blooded murder of a government employee. This sort of thing reaches its most uproarious extreme in a scene in which Geezer seems to be actively considering waterboarding a priest (one story revolves around that old chestnut of a priest not being able to reveal the identity of a killer due to the seal of the confessional being sacrosanct). I say ‘uproarious’ because so much of Hard Sun really beggars credibility – there’s the peculiarly vague contents of the USB stick, along with the behaviour of the leads and their byzantine back-stories. Coupled to the fact that the show clearly takes itself very seriously indeed, the result is a programme which is just an unintentional black comedy more than anything else. 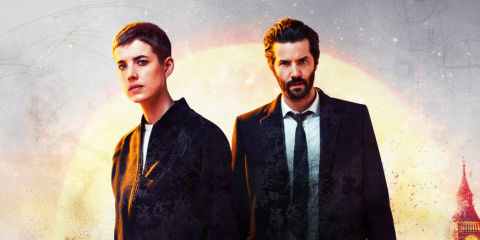 I suppose I could imagine the BBC making a show like Hard Sun and it being more, um, good, about twenty years ago, when even the best of us were not immune to the odd pre-millenial jitter. Nowadays, though? Not so much. One plot thread which feels like a particular misstep concerns the ominous dark apparatus of the Security Services, who pursue Geezer and Gamine throughout the series in order to get the USB stick back (despite the fact that everyone is supposedly convinced the apocalyptic data is fake). Playing their nemesis is Nikki Amuka-Bird, who played the curiously inept government minister in New Survivors and plays a somewhat more competent spook here. That’s the thing, I would say: these days we’re not worried that our governments are up to brilliantly-conceived and ultra-secret machinations behind our backs. In the time of Donald Trump and Theresa May, our main concern is that our governments really are as hapless, clueless, and incompetent as they routinely seem to be. It would be great if the BBC actually had the nerve to make a proper SF TV series, rather than just smuggling a few SF elements into what’s essentially a very dark, very silly cop show. But there you go: such is the world we live in today. Every episode of Hard Sun concludes with a countdown timer, ticking down the days before armageddon’s arrival, and one can only conclude that the BBC and their co-producers Hulu have half an eye on this actually running for five years. Well, I’ll be surprised – but if it even makes it to a second season, the manner in which this one concludes suggests that in any subsequent outings this show will become a rather different beast. That can only be a good thing, because at present there’s at least as much daftness as darkness in Hard Sun.